I get stressed very easily. You have no idea how much a tough battle freaks me out or the mere thought that I might be unable to progress through a game, causing me to ponder with unease all the fun I might be missing out on if I’m never able to overcome the challenges set before me. I know these are just games. They are for fun, and thus, there is no pressure to complete them. There are no global consequences as a result of our inability to traverse a series of tricky obstacles or pummel a monster into submission, but that knowledge doesn’t seem to help. And yet, what would seem like quite a contradiction is the fact that I seem to like stressful games. As I work my way through the old Squaresoft games, the next one I tried was “Final Fantasy IX”. When I first started this game, my initial impressions were not great, and I think a lot of it had to do with the game straying from what I expected it to be. You see, most “Final Fantasy” games tend to be more on the serious side, while this one was rather goofy. Plus, many of the games kind of have a mix of fantasy and sci-fi, while this one was more strictly fantasy, another thing that rather disappointed me. And I was unsure about the style of graphics. So I was being pretty judgmental about this game, I think. Behold, the first of United We Game’s series of community posts on “Mario” levels, this one by Hatm0nster AKA Jacob, fellow administrator of United We Game! Mario has been Nintendo’s flagship franchise since they first burst onto the scene with Super Mario Brothers for the NES (Or with the Donkey Kong arcade game if you want to get technical). It takes quite a bit to maintain that kind of staying power for more than 25 years, and we can rest assured that it’s not the portly plumber himself who’d the cause for the series overwhelming success. No, instead it’s always been Nintendo’s ingenious ability to consistently push the boundaries of level design as we know it. Nearly every main series entry has shown us new ways to explore the world with our mustachioed friend, and has left long-time fans with a lifetime’s worth of memorable locations that we can’t help but mentally revisit from time to time. The following are but just a few of my personal favorites. Finishing this level was actually one of those few things that beat the feeling of completing the Pachinko Machine level. It’s a challenge that, even though it’s stupidly hard, I heartily recommend that every Mario fan should at least attempt. This was the single hardest challenge I’ve ever faced in a Mario game. The challenge is simple, collect all the coins in the level. However, that simplicity comes with a catch: you are given just a little more than enough time to get them all, and you can never touch the same platform twice. It’s hard, unforgiving, frustrating in the utmost, but like the Pachinko Machine, the feeling of beating it is almost unmatched! It stretches your command of Mario’s abilities to their very limit and walking away victorious feels like earning your platformer mark of mastery! If you haven’t tried it, go do it now! You don’t know what you’re missing! My first experience with Mario was with Super Mario Brothers 3 (The All-Stars version on the SNES), and for the most part I found it pleasant and fun until one stormy afternoon when I warped myself to World 8, and wow. I was really young at the time, so going from bright and happy to what looked more or less like hell was kind of scary. And what’s more, the first level played differently. It wasn’t a regular stage, but an army procession filled with intimidating machines of war and projectile-death all over the place! I did beat it eventually, but that incredibly jarring transformation has stayed with me ever since. I suppose that’s why it’s a favorite, it turned everything about the tone of the game one its head and yet still built on the pre-established gameplay. It caught me off-guard, something that no other level has ever managed to do. This was the level that hooked me into Super Mario World! Up until that point the game had offered up the usual platforming fare: jumping, swimming, quirky blocks, and power-ups, but then this castle comes along and suddenly I get to not only climb all over the screen but flip to the other side too?! It was just too incredible! Instead of jumping over enemies, I could climb behind them. Instead of jumping on their head, I could punch them off! What sorcery was this?! The mechanic wasn’t used much afterward, but I didn’t care, the simple fact that I could do something like that was just too exciting to write-off. Everything about this level was, no is, perfect! 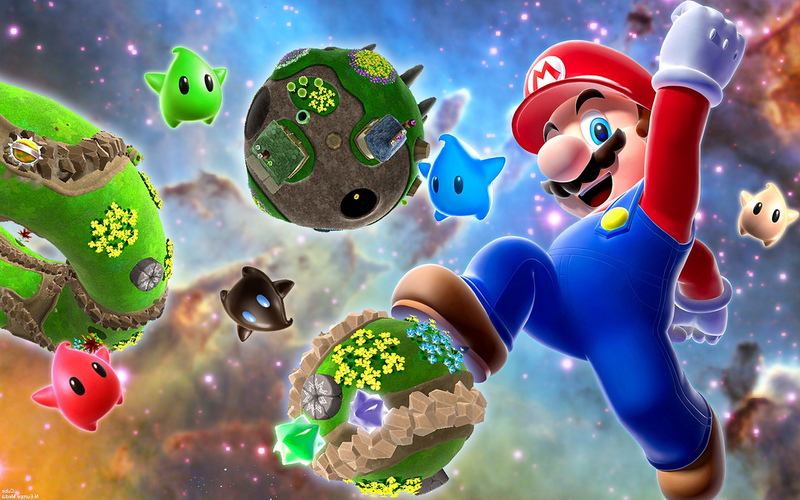 This was the one that convinced me that Super Mario 64 was not only good, but special. It starts off by just dropping you into the thick of it. One second you’re looking at Peach’s face transforming into Bowser’s ugly mug, and the next you’re in a new level unlike anything else in the game before it and told to find your way out…if you can! The obstacles are daunting but just challenging enough to keep you cautious, the music drives you forward with purpose while simultaneously inspiring a sense of awe and wonder; There’s a secret star to be found, extra lives for those that dare attempt to retrieve them, and it’s all finished off with our first face to face with a 3D Bowser! I have played this level dozens of times over the years and it has never gotten old. All those incredible feelings from that first encounter still surface after dropping into it and have barely diminished. Is it the best Mario level ever made? Objectively, no. Probably not. But for me it’s the pinnacle. From feel, to design, to challenge, to tone, for me this level is flawless! I could list so many more, but stopping there just feels right. 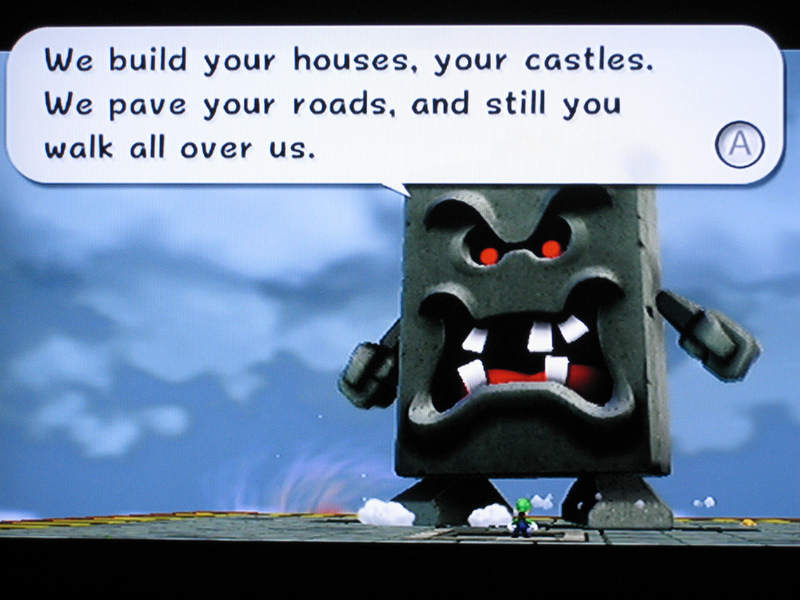 The Mario games are just so chock-full of wonderful places that even some of the great ones wound getting forgotten. These were just the ones that left the biggest impression on me. What are yours? Are they all favorites because they were just wonderful to explore, or was it the rush of beating them that enabled them to rise through the ranks into favorites? I’ve been busy, so I’ve been a little slow on posting lately. But, I’ve finally gotten around to providing you all with another taste of written joy. Day 4 of the 30 day video game posts (wow, I’ve only done 4…) is your “guilty pleasure” game, whatever that is. I suppose this is referring to a game that I enjoy, but feel a bit silly admitting that I enjoy it. Well, I have several games that I have fun with that I am also a little embarrassed by, due to their childish nature. One of those games, and the subject of this post, would be “Bomberman Generation”. Now, I am not embarrassed in the slightest by my one other console (I have a few handheld ones, too, though that number has dwindled in recent years, as one unlucky game got sold) “Bomberman” game, “Super Bomberman 2” for the Super Nintendo. (In case you’re wondering, it really was super.) I would only be reluctant to admit I own it because mentioning the word “bomb” aloud is not a good idea. But, other than that, it is a delightful game where you get to control cute, little Bomberman through several worlds, blowing up obstacles and enemies (though, I do admit the concept sounds terribly violent). A good time if there ever was one. Due to the great joy experienced while playing this game, I decided to buy “Bomberman Generation” for the GameCube. Here’s where the guilt comes in. This game is a lot different from the game I enjoyed on the SNES, aside from the fact that someone named Bomberman is in it, and he uses, well, bombs (I doubt the accuracy of the “man” part of his name, though). This, ahem, Bomber-boy is taller now than the stubby version I was used to and creeped me out to no small degree. And the game, while being many years newer than the other one, still uses lots of bright, cartoonish colors (which isn’t really a bad thing, but I’m getting to my point!). Along with cutesy sound effects. And obnoxious voice acting, including some occasionally indistinguishable dialogue from Bomberman himself (did you just belt out “vessel” or “special”?). All of that combined to produce a game that felt rather childish (except for the villain wearing no pants, which should not be seen by anyone, young or not-as-young, alike), and it seemed like someone my age had no business playing it. To top it off, they added Charaboms, which are basically Pokemon. I don’t know how they fit into the game, and I don’t understand why I must make these things engage in battle, or why they insist on making ridiculous sounds all the time. Leave the Pokemon to the actual “Pokemon” games, where they, frankly, do a much better job of it. They have no place in “Bomberman”, and it further made me hope very hard no one would walk in while I was making the goofy things fight each other. Despite some discomfort playing such a silly game, it still was fun, hence it is my guilty pleasure game, and not just my guilty game (like some of the “Spyro” games not made by Insomniac, which had plenty of guilt, but very little pleasure). I did have a great time playing the game. It was much fun, with the right amount of challenge, and I enjoyed trying to find all the secret card items, even if they don’t really get you anything that great. It still retained some similarities to the SNES “Bomberman” game I loved, whilst including some very familiar multiplayer (who doesn’t enjoy blowing up their friends?). It was a silly, but cheerful, game that provided me with hours of, sometimes embarrassing, fun. There you go, another topic discussed. A Guilty Duck, Even Though I Did Nothing Wrong! Today’s topic of the 30 day game posts, as you can guess, is a game that’s underrated, and the first game that comes to mind is “Vexx”. I’ve actually written about this game before. “Vexx” is quite a wonderful game, but I have only met one other person that has played it. It is a platformer made by Acclaim, for the GameCube, XBox, and PS2, and while very few have heard of it, it is a very fun, very unique game I think many would enjoy. I love this game so for many reasons. For one, the locations are unique and beautiful. Vexx’s world was torn apart, so each location is floating. And each place is so different. There’s the strange tower behind the waterfall in Timberdale. The desert with the giant dragon skeleton and a maze of underwater tunnels below. There’s the giant dome of water in the Below, where you’ll find smaller domes with various puzzles and challenges inside. There’s also the lovely Summit of the Sages, home of three giant stone heads with vastly different secrets inside. As time passes in these places, the locations change as day turns to night and back again. Nighttime sees enemies become more vicious and the music more sinister, making you want to run and find a sundial to change time back to the relative safety of day. The music in this game is beautiful, as well, consisting of violins and pianos and other such things. The game is quite a challenge, too, which is nice when so many games nowadays are too easy. The game is also filled with variety. You collect Shadowwraith Hearts to progress to the next world, and each one has a riddle associated with it. Solve this riddle, and the heart is yours. Sometimes this involves platforming. There’s the occasional boss battle (this game actually has few of those, which is good, because they are tough). There are times when you must collect items, like soul jars and heart shards. There are puzzles, as well, like the block puzzle in Daggercrag and the statue puzzle in the Below. The riddles are a lot of fun, and in a small way, I like to think of it as a platformer version of “The Legend of Zelda”. The game is not perfect, though, and is lacking in some areas. There is very little story in the game and very few characters, as well. But, the game is still fun enough and the gameplay varied enough to make up for that. And Vexx, the main character, has personality of his own. This guy has attitude, and while he’s small, he, like the game, should not be underestimated, as he has some razor sharp Astani War Talons to pummel his enemies with. Plus, I can’t dislike someone who flips off the main villain. Or kicks a goblin-like creature in the you-know-where to get an item the fiend’s holding out of reach. So there it is, “Vexx”, an extremely underrated game. Sure, this is not the game to play if you’re in the mood for complex stories and interesting characters, but it’s still a very fun game to play, nonetheless. It can be pretty darn hard, too, but it’s fun enough that I wanted to keep trying. I loved the challenge and the variety and the unique locations and music, which all make this game really stand out for me. If anyone wants to try out a game that isn’t so well-known, give “Vexx” a chance. At the very least, it won’t be something you’ve seen a million times before. “Lost Kingdoms II” is much better than the first game, and the music is no exception. So I listed my top 10 songs from the game with links to Youtube. 10. “Cathedral” is played in the Grenfoel Church. The music, as expected, sounds like it’s played on an organ. It is a bit more dramatic than it needs to be, though. 9. “Obeonix Gorge” is an icy place with pretty music. I like the parts with the harp especially. 8. “Leod VIII’s Theme” is the theme of Leod VIII. I really don’t like this creepy guy, but he has a good theme song. It sounds like a harpsichord and has a bit of a sinister sound to it. 7. “Isamat Urbur” is a really weird place that seems to belong to the Isamat Urbur cultists. The music is simple, with a single sound repeated throughout the whole thing, with a few other sounds added in parts. That repeating sound does a good job at making one feel rather uneasy in that place. 6. “Runestone Caverns” is played in both parts of this level. I love how this music is calm during parts and then it gets all dramatic. It goes well with trudging along through the caves while nothing much is happening, then all of a sudden oh my gosh what is that weird ball of light waaah!!! That’s what it makes me think of. 5. “Krasheen Mountains” is played in the mountains. It is a rather epic song that definitely makes you feel like you’re high in the mountains. I especially like the part that starts around 0:50. 4. “Battle Theme” is the song that plays during boss battles. It is fast and epic. 3. “Bhashea Castle” is a creepy place that was swallowed up by the Black Fog 200 years ago. The music for this level is also very creepy and sounds almost like ghostly voices. I love this song, and it does a good job making me feel lonely and like somebody might be watching me. 2. “Ruldo Forest” is a beautiful, slow song. It fits the area really well and gives the place a mysterious feel. I didn’t really notice certain parts until I really listened, and there are almost mournful sounds at times that gives the place a bit of a lonely feel. 1. “Coliseum” is played in the Sacred Battle Arena. This music is fast and awesome and is the best song of the game. (Hey, it’s post 200!) I recently played “Lost Kingdoms II”, sequel to, you guessed it, “Lost Kingdoms”. I already summarized the basics of the series in the post on the previous game. You know, you summon monsters with cards and such. So that leaves me with more time to discuss the other aspects of this game. So let’s start discussing. This game takes place about 200 years after the first, and the main character is a thief named Tara, a young woman with a mysterious past. Story-wise, the Kendarians have somehow learned how to mass produce Runestones, the magical stones that allow people to control monsters (though, they are weaker than the real things). As the story progresses, you figure out just how they are doing this, and you find out who Tara really is. This game is much fancier than the previous one. You see, the previous one was fun, but lacking in many areas. In this one, they went all out. For one thing, the levels look much nicer and are much more interesting. The music is better. The graphics are a little nicer (strangely, though, Gurd looks worse than ever). I think more story is thrown in, and there are more characters, such as Tara’s friend, Sol. The map screen is divided into several screens now, with much nicer artwork rather than the mainly brown, un-detailed version of the last game. It’s also much easier to get money because now any excess magic stones you get count as money. The previous game made you sell cards to get money, which I simply refused to do. They also added voice acting, though, which is not very good. That was not an improvement. They also made changes to the most important part of the game, the monsters. Now, instead of 105, there are about 226, I believe. All I have to say about that is a big fat YES. They’ve also added machine creatures and creatures you can transform into, allowing you to control the creature for a short time. These particular creatures are extra useful because they can be used to jump up ledges, fly across gaps, or break through obstacles. Or you can just pummel some enemies, if you so choose. The battling has also been changed. In the last game, you would randomly get into battles with enemies you can’t see until the battle starts, but now enemies are seen roaming the levels and can be fought or fled from at your choosing. Overall, this is really quite a fun game. I still don’t care for any of the characters, and I think the voice acting ruins things a bit, but the much better levels and huge variety of new creatures, such as the Valkyrie, new dragon creatures, Gorgons, and Thanatos, makes this game great. And because of the transform creatures, you have a reason to revisit levels to get things you couldn’t get before. These creatures also help you get to an extra level that I particularly wanted to mention, Bhashea Castle, which I like very much. This is the castle that was overrun by the Black Fog in the original game and is never seen in that game. It is now in ruins and haunted by creepy and powerful monsters like the scary Death and the formidable Stone Head. And if you can solve some puzzles and get all four blades, you can reawaken a powerful warrior…. I love that level, especially the first time I played it. It was just so spooky and awesome. After getting all 105 creatures in the first game, it bothers me quite a bit that I can’t get all the cards in this one. I got 225 out of 226. It’s upsetting. I remember from the past that you only have one chance for two of the cards. If you open this chest on the Bridge of Sarvan, the Lucky Lion is forever locked away (well, in that file). I knew this, so I was careful, and now the Lucky Lion is mine. But, then there’s the Barometz. I knew it only showed up a short time in the first part of Alanjeh Castle, but did I get it? No. No, I did not. When you finish a level, you often can choose these cards that are flipped over. I thought I could do that and get my Barometz that way. I guess not. It bothers me so much. That empty space in the catalog is like a punch to the face. And what kind of sicko would punch a duck? Huh? What sicko indeed! Why do you deprive me of my Barometz, company who made this game? 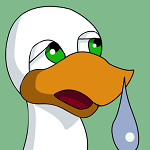 Why do you indirectly land a blow to the face of this innocent duck? Have you no souls? Did the God of Harmony steal them from you as it did to the innocent folks in the game? Is that what happened, you sick people! Is it? Is it! Ahem, cough, hmm. I am proud to say that I was able to, at least, get nearly all the cards, including the Emperor. Actually, this brings up a story that can be considered amusing or horrendous, depending on how you look at it. Last time I played the game, I got every card except for the Lucky Lion (yes, I even obtained the elusive Barometz). I decided to start a new file and play through to the Bridge of Sarvan and get my Lion, so I can at least say I have every card, even though they aren’t all within one file. And then guess what happened. I overwrote my file with the 225/226 cards, even losing my beloved Emperor. So finally, this time playing through the game, I decided I was getting the Emperor back. Perhaps I must explain, though. After beating the game, a new level opens up called the Proving Grounds. It is 25 levels of unimaginable horrors (but not really, but it can get pretty bad) and at the very end awaits a powerful creature called the Emperor. This is one tough beastie who used to defeat me countless times, and after losing him in my last playthrough, I vowed to conquer him again. It only took two tries this time. The first time he destroyed me, not unlike a hungry child attacking a bowl of Jell-O (and I’m the Jell-O). The second time I got lucky and learned a great trick. Leave an immobile, independent creature in the middle of the room, and the idiotic Emperor will repeatedly try to attack with pillars of fire, but far enough away that they never reach my creature. So this left me to attack him while he was too distracted to massacre me as he usually did in the past. His health started to get very low, and my heart started racing. Soon, the Emperor shall be mine again, after all these years apart! Once his health was almost gone, I threw a Capture Card at him. Nothing. Crap! I threw another, and I captured that son of a… Oh, glorious day! The duck is the victor once again! Sound the trumpets! Prepare a banquet! Vacuum the carpet! There will be merriment like never seen before! So anyway, this game really improves on the original in almost every way. Except the voice acting. And the knife that is forever embedded in my heart for not having every creature. “Lost Kingdoms II” feels like a much more solid game, while the original was a little bit of a mess. For a while, though, I used to like the original better. I liked Katia better (even though she had no more personality than Tara). I liked that there was no voice acting, and it felt simpler and more pure, and with less monsters, you could get more attached to the few (if 105 can be called few) you had. But, now that I have replayed the sequel, I can’t help but admit it is really a much better game than the original. But, both have a place in my video game library. The original, simpler “LK” and the much fancier, much improved “LKII”.